Cute an easy DIY felt hearts! Perfect for Valentine's Day! Get ready for Valentine’s Day with these DIY felt hearts! These darling hearts are quick and easy to make and perfect to display alone, or use in various projects! Start by grabbing the heart template by adding your info below. Cut out the paper hearts in the sizes you want to use. I cut them all out just so I could move them around and see what I liked. Next cut some hearts out of felt. You can make a plan ahead of time or just go for it! Use the big hearts as a base to add smaller hearts to. You can stitch around the edges of the biggest heart or any of the hearts you want to layer. Stitch on pearly beads then use a thin layer of hot glue to stick the layers of hearts together. If you’d like your hearts to be firmer for making wreaths or a garland, hot glue a second heart to the back. If the lower layer doesn’t quite match up, trim the edges. These DIY felt hearts come together so quickly and are so cute and festive! Make more DIY felt hearts to create fun projects! Grab a few hearts and hot glue them to an embroidery hoop to create a quick wreath for your door or wall. Tuck in with your everyday decor or hang on the corners of picture frames for a festive touch. Add mini clothespins and fishing line for an easy garland. Glue some DIY felt hearts to a wreath form for a darling wreath. Arrange hearts on a charger for some cute table decor. Like these? Try making these projects with paper flowers and doilies! 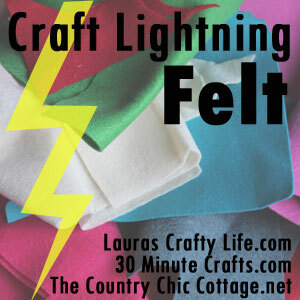 These DIY Felt Hearts are part of Craft Lightning – felt edition! Check out all the ideas from awesome bloggers! So many ways to use these! Thanks for joining! So cute and so simple; and I’ve got tons of leftover felt so I could totally whip some of these up! and I agree, they’d be so great to add to other projects! Oh my goodness! Those are so cute!! I love how easy they are too! Thanks Danielle! I had fun with these! These hearts are so beautiful! *_* Your post makes me want to make some for my children and my hubby. Lovely! Thank you Luana! They come together really quickly! These are so stinking cute, Christine!! They could be used so versatile! Super cute! I can imagine so many projects for using these hearts! Where is the template for these hearts? About halfway down the post there’s a spot to enter your email so it can be sent to you.